بهبود نگرش گلخانه‌داران، به‌عنوان متولیان تولید، نسبت به کشاورزی پایدار می‌تواند زمینه‌ساز افزایش پایداری این نوع نظام کشت گردد؛ بنابراین هدف این پژوهش، بررسی عوامل مؤثر بر نگرش گلخانه‌داران به کشاورزی پایدار در استان البرز بود. تحقیق حاضر از لحاظ هدف، کاربردی و از نظر گردآوری داده‌ها میدانی است. جامعه آماری تحقیق حاضر را 366 گلخانه‌دار فعال استان البرز (366N=) تشکیل می‌دادند. با استفاده از فرمول کوکران حجم نمونه 155 مورد تعیین شد که با استفاده از روش نمونه‌گیری طبقه‌ای با انتساب متناسب برحسب شهرستان‌های محل فعالیت انتخاب شدند. ابزار جمع‌آوری داده‌ها در تحقیق حاضر پرسشنامه بود که روایی آن، توسط پانل متخصصان دانشگاه تهران و پایایی آن نیز با ضریب آلفای کرونباخ 85/0 مورد تأیید قرار گرفت. نتایج نشان داد که 41 درصد از گلخانه‌داران نگرش مثبتی به کشاورزی پایدار داشتند. یافته‌های مقایسه میانگین حاکی از وجود اختلاف معنی‌دار بین نگرش گلخانه‌دارای دارای تحصیلات مرتبط با کشاورزی و غیرمرتبط بود. تحلیل همبستگی نشان داد که بین رفتار اطلاع‌یابی و استفاده از کانال‌های ارتباطی با نگرش رابطه مثبت معنی‌دار وجود داشت. علاوه بر این نتایج تحلیل رگرسیون چندگانه نشان داد که چهار متغیر وارد شده به مدل حدود 40 درصد از واریانس نگرش گلخانه‌داران نسبت به کشاورزی پایدار را تبیین می‌کرد. در نهایت نتایج این تحقیق پیشنهاد می‌کند که با توجه به تأثیر نگرش بر نوع رفتار، می‌توان با تغییر نگرش گلخانه‌داران از طریق اطلاع‌رسانی و انواع مختلف آموزش، پایداری تولید را افزایش و سلامت عمومی جامعه را بهبود بخشید. The attitude of greenhouse owner as the basis of agricultural production towards sustainable agriculture could be grounds for increasing the sustainability of this type of cultivation system. Therefore, the main purpose of this study is to investigate the factors affecting the attitude of greenhouse owners towards sustainability in the Alborz province. The target population for this study consisted of all active greenhouse owners in the Alborz province (N=366). The sample size was determined by using Cochran’s formula (n=155) and using the proportional stratified random sampling method. The validity was confirmed by a panel of experts and its reliability was established by Cronbach's Alpha coefficient (0.85). The results showed that the attitude of 41 percent of the respondents towards sustainability was positive. Also, there were significant differences between the attitudes of the respondents in the group with related education and unrelated education group. Correlation analysis showed that the there is a positive relation between attitude towards searching behavior and the use of communication channels. In addition, the results of multiple regression analysis indicated that about 40 percent of the attitudes of greenhouse owner towards sustainable agriculture are explained by 4 variables. The result of this study indicate that by using different means of providing information and training, we can change the attitudes of greenhouse owners and lead them to produce more sustainable and healthy product. اکبری، م. و اسدی، ع. 1385. برخی چالش­های کشاورزی نوین بر خاک و محیط‌زیست. همایش خاک، محیط‌زیست و توسعه پایدار، کرج، پردیس کشاورزی و منابع طبیعی دانشگاه تهران، 17 و 18 آبان. تهران. خوش مرام، م. شیری، ن. شرفی، ل. 1393. عوامل مؤثر بر نگرش کارشناسان ترویج کشاورزی نسبت به کشاورزی ارگانیک. فصلنامه راهبردهای توسعه روستایی، 1( 4): 90-75. رحمانی، ح. نورکی، ف. برادران، م. 1390. بررسی نقش نگرش گلخانه­داران در خصوص کشاورزی پایدار بر روی عملکرد گلخانه­های صیفی استان خوزستان. اولین همایش ملی مباحث نوین در کشاورزی، 11 آبان، ساوه. روستا، ک. حاجی آبادی، م. 1392. بررسی روش­ها و تکنیک­های تأثیرگذار بر دانش، نگرش و مهارت بهره برداران، درباره مدیریت پایدار منابع طبیعی (مطالعه مورد استان خراسان جنوبی). مجله تحقیقات اقتصاد و توسعه کشاورزی ایران، 44(4): 665-677. سلیمانی، س. میردامادی، س.م. حسینی، ف. 1388. بررسی عوامل تأثیرگذار بر نگرش کشاورزی پایدار مهندسین ناظر طرح محوری گندم استان فارس. مجله اقتصاد کشاورزی و توسعه، 17(68): 37-56. شفیعی، ل. پورجوباری، ز. 1387. بررسی بازاریابی محصولات گلخانه‌های در استان کرمان. مجله کشاورزی، 8(2): 34-23. عباسی، ف. چیذری، م و اسدی، ع. 1391. تحلیل موانع پذیرش فناوری­های راهبرد مدیریت جامع تولید و حفاظت از محصولات باغی از دیدگاه گلخانه­داران استان اصفهان. مجله تحقیقات اقتصاد و توسعه کشاورزی ایران، 43(3): 434-421. کوچکی، ع. و خلقانی، ج. 1377. کشاورزی پایدار در مناطق معتدل، فرانسیس، چ. ا. فلورا. ک، ب. و کینگ، ل. د. انتشارات دانشگاه فردوسی، مشهد. قاسمی، ص. کرمی، ع. 1388. نگرش­ها و رفتارهای گلخانه داران استان فارس نسبت به کاربرد سموم شیمیایی در گلخانه­ها. مجله اقتصاد و توسعه کشاورزی (علوم و صنایع کشاورزی)، 23(1): 28-40. قدیمی، س.ع. فمی، ح ش. اسدی، ع. 1391. بررسی عوامل مؤثر بر نگرش کشاورزان نسبت به کشاورزی ارگانیک (مطالعه موردی: شهرستان فرید)، مجله پژوهش­های ترویج و آموزش کشاورزی، 5(4): 69-80. کرانی، ز. شیری، ن. صالحی، ل. 1393. نگرش کشاورزان استان کرمانشاه به عملیات حفاظت خاک. فصلنامه تحقیقات اقتصاد و توسعه کشاورزی ایران، 45(1): 143-154. یعقوبی، ج. جوادی، ع. 1393. موانع تولید محصولات ارگانیک از دیدگاه کارشناسان جهاد کشاورزی، نشریه دانش کشاورزی و تولید پایدار، 24(1): 57-68. Adebayo, S. A. and Oladele, O. I. 2012. A review of selected theories and their applications to information seeking behavior and adoption of organic agricultural practices by farmers. Life Science Journal, 9(3): 63-66. Adeola, R., 2010. Influence of Socio-Economic Factors on the Adoption of Soil Conservation Measures in Ibadan/Ibarapa Agricultural Zone of Oyo State. Report and Opinion, 2: 42-47. Ahnström, J., Höckert, J., Bergeå, H. L., Francis, C. A., Skelton, P., and Hallgren, L. 2009. Farmers and nature conservation: What is known about attitudes, context factors and actions affecting conservation?. Renewable Agriculture and Food Systems, 24(01): 38-47. Best, H., 2008. Organic agriculture and the conventionalization hypothesis: A case study from West Germany. Agric. Human Values, 25: 95-106. Bond, J. L., Kriesemer, S. K., Emborg, J. E. and Chadha, M .L. 2009. Understanding farmers' pesticide use in Jharkhand India. Extension Farming Systems Journal, 5: 53-62. Caviglia Harris, J. L., 2003. Sustainable Agricultural Practices in Rondônia, Brazil: Do Local Farmer Organizations Affect Adoption Rates?. Economic Development and Cultural Change. 52: 23-49. Chouichom, S. and Yamao, M. 2010. Comparing opinions and attitudes of organic and non-organic farmers towards organic rice farming systems in northeastern Thailand. Journal of Organic Systems, 5(1): 25-35. Dennis, J. H., Lopez, R. G., Behe, B. K., Hall, C. R., Yue, C., and Campbell, B. L. 2010. Sustainable production practices adopted by greenhouse and nursery plant growers, Hort Science, 45(8): 1232-1237. Fakoya, E. O., Agbonlahor, M. U. and Dipeolu, A. O. 2007. Attitude of Women Farmers towards sustainable land Management practices in South Western Nigeria. World journal of Agricultural sciences, 3(4): 536-542. Farshad, A., and Zinck, J. A., 1998. 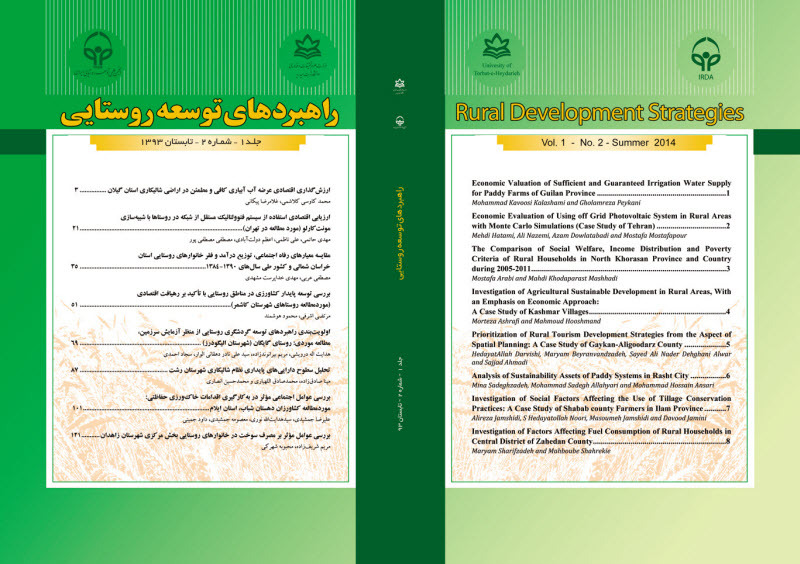 Traditional irrigation water harvesting and management in semiarid Western Iran: A case study of the Hamadan region. Water International, 23: 146-154. Ganji H. 2001. Personality Assessment, Tehran University,Savalan Publisher. pp. 203 -205. Hall, T. J., Dennis, J. H., Lopez, R. G. and Marshall, M. I., 2009. Factors Affecting Growers' Willingness to Adopt Sustainable Floriculture Practices. Hort Science 44: 1346-1351. Hosseini, S. J. F., Mohammadi, F., Mirdamadi, S. M., and Hosseini, S. M. 2012. The Perception of Greenhouse Owners about Environmental, Economical and Social Aspects of Sustainable Agriculture in Iran. International Journal of Agricultural Science and Research, 1(1): 1-10. Liu, W., Wu, W., Wang, X., Wang, M. and Bao, Y. 2007. A sustainability assessment of a high-yield agroecosystem in Huantai County, China. International Journal of Sustainable Development & World Ecology, 14(6), 565-573. Menozzi, D., Fioravanzi, M., and Donati, M. 2015. Farmer’s motivation to adopt sustainable agricultural practices. Bio-based and Applied Economics, 4(2): 125-147. Ngombe, J., Kalinda, T., Tembo, G. and Kuntashula, E., 2014. Econometric Analysis of the Factors That Affect Adoption of Conservation. Farming Practices by Smallholder Farmers in Zambia. Sustainable Development, 7: 124-138. Petros, T., 2010. Adoption of Conservation Tillage Technologies in Metema Woreda, North Gondar Zone, Ethiopia. Master thesis, Haramaya University, Haramaya. Pretty, J. U. L. E. S. 2005. Sustainability in agriculture: recent progress and emergent challenges. Issues in Environmental Science and Technology, 21: 1-15. Rao, N. H. and Rogers, P. P. 2006. Assessment of agricultural sustainability. CURRENT SCIENCE-BANGALORE, 91(4): 439. Rogers, E. M., 2003. Diffusion of Innovations. Fifth edition. Free Press, New York. Sadati, S. A., Shabanali Fami, H., Kalantari, K., Mohamadi, Y. and Asakere, A. 2010. Investigating effective factors on attitude of paddy growers towards organic farming: a case study in Babol County in Iran. Research Journal of Applied Sciences, Engineering and Technology, 3(4): 362-367. Tatlıdil, F. F., Boz, İ. and Tatlidil, H. 2009. Farmers’ perception of sustainable agriculture and its determinants: a case study in Kahramanmaras province of Turkey. Environment, development and sustainability, 11(6): 1091-1106. Terano, R., Mohamed, Z., Shamsudin, M. N., and Latif, I. A. 2015. Factors Influencing Intention to Adopt Sustainable Agriculture Practices among Paddy Farmers in Kada, Malaysia. Asian Journal of Agricultural Research, 9(5): 268-275. Van Thanh, N. and Yapwattanaphun, C. 2015. Banana Farmers’ Adoption of Sustainable Agriculture Practices in the Vietnam Uplands: The Case of Quang Tri Province. Agriculture and Agricultural Science Procedia, 5: 67-74. Velten, S., Leventon, J., Jager, N. and Newig, J. 2015. What Is Sustainable Agriculture? A Systematic Review. Sustainability, 7(6): 7833-7865. Zhen, L. and M. A. Zoebisch, 2006. Resource use and agricultural sustainability: Risks and consequences of intensive cropping in China. Kassel University Press, Kassel, Hessen Germany, ISBN-13: 9783899582215, 202.